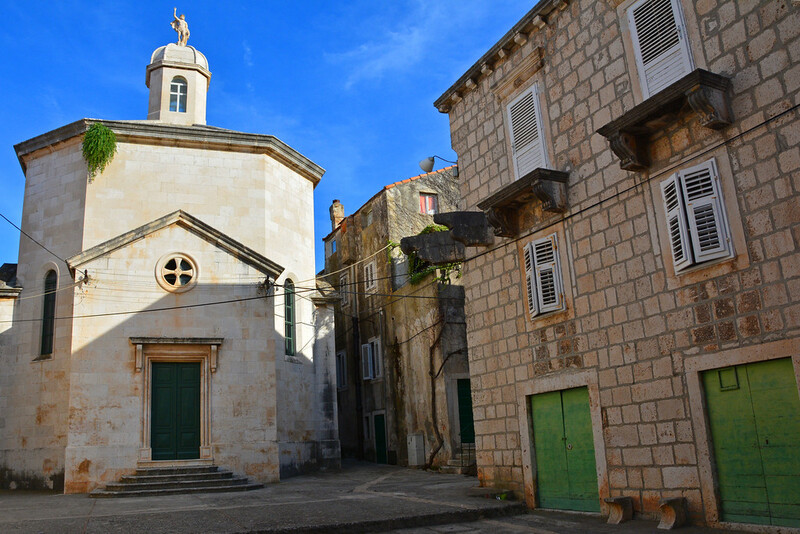 Korcula (Korčula) was the final island stop on our self-made Croatian island hopping itinerary, following visits to the islands of Vis and Hvar. 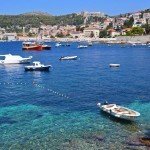 It is the 6th largest, but the second most populated, of the Adriatic islands. Marco Polo is reputed to have been born here, though there is isn’t solid proof of this claim. Even still, his supposed house of birth still remains a popular attraction in the Old Town. 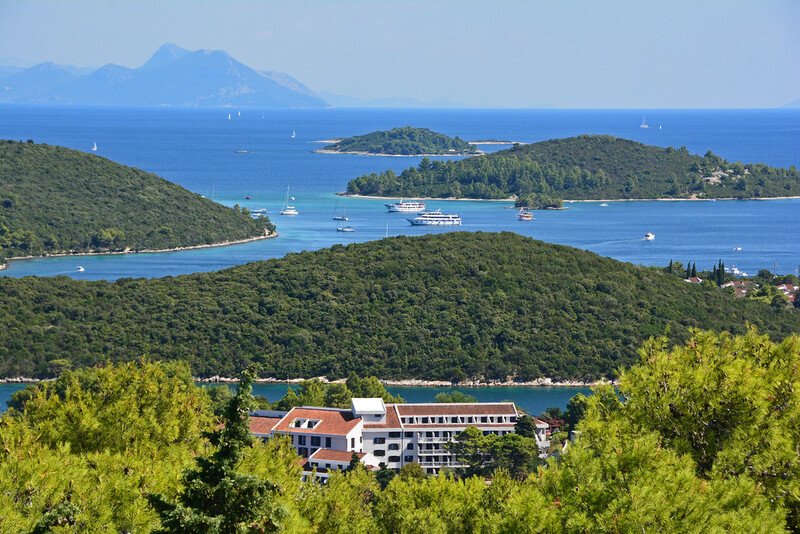 With its (possible) Marco Polo notoriety, walled medieval Old Town, and nearby archipelago, this island is ripe for adventurous exploration! 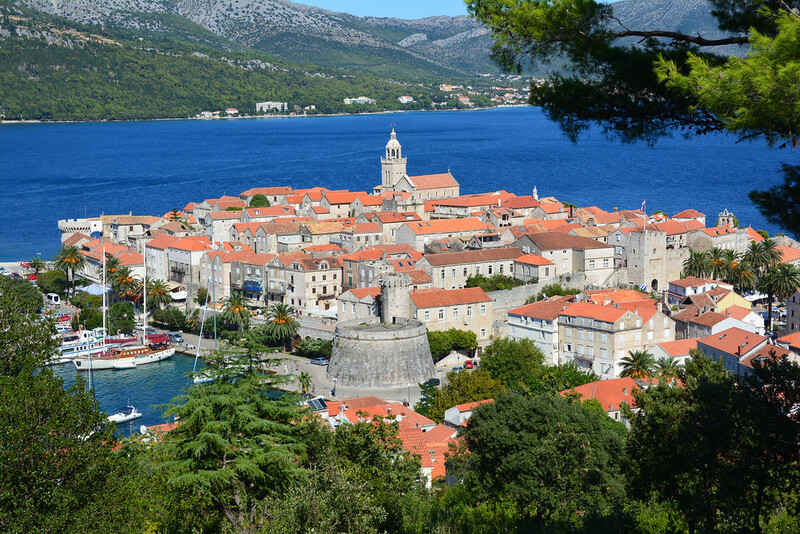 There are 3 main settlements (towns) on the island- Korcula, Vela Luka, and Blato. 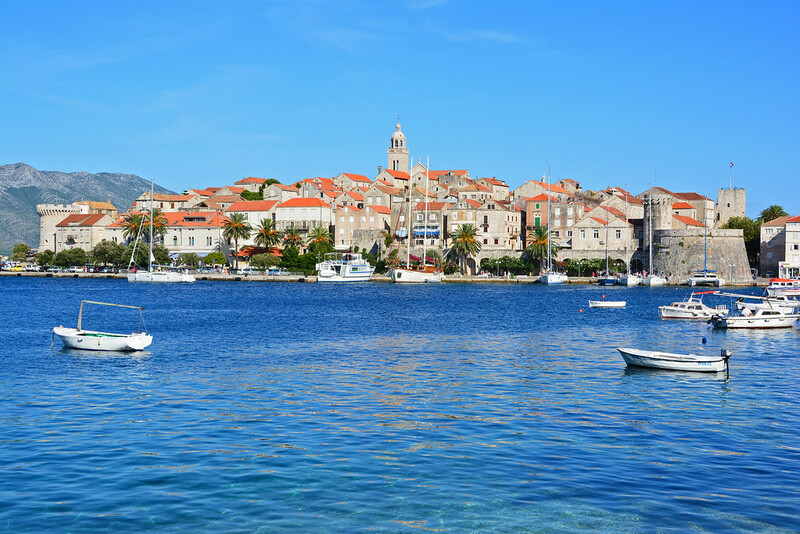 We based ourselves in the town of Korcula and didn’t venture too far during our stay on the island. 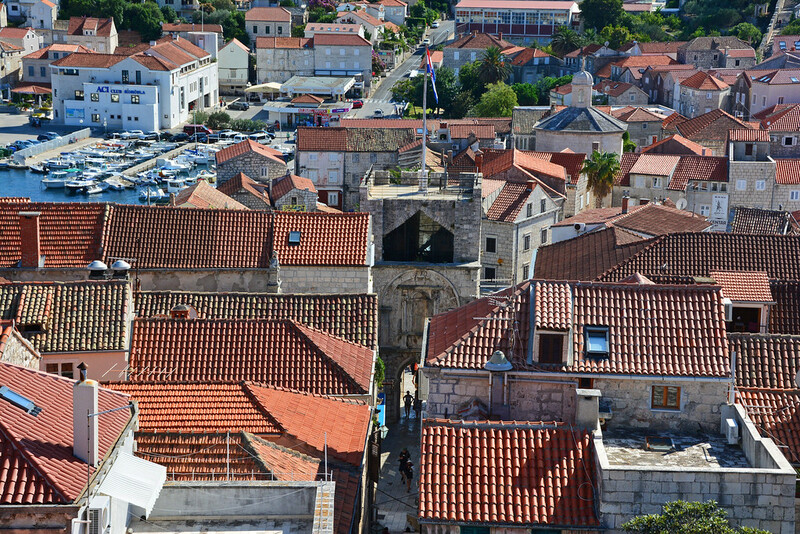 With plenty to explore in the heart of the Old Town, you’ll definitely be able to fill a few days. 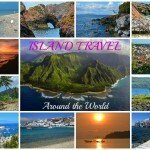 Though many feel that you have to take a bus or scooter to other parts of the island to find great beaches, we found a few great swimming spots just minutes from the apartment we booked with Booking.com. 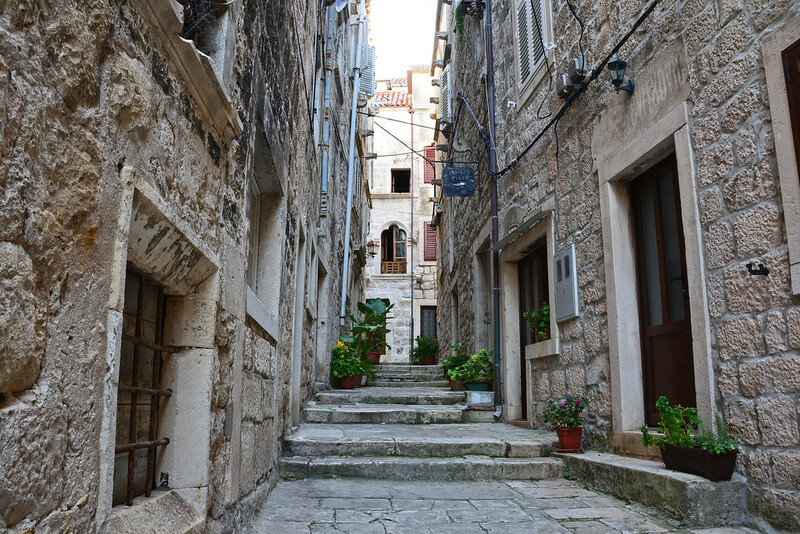 Feel as if you’ve been whisked back to centuries ago as you spend a couple of hours wandering through the narrow alleyways of Old Town Korcula. This medieval town doesn’t require a lot of imagination, as much has been beautifully preserved. 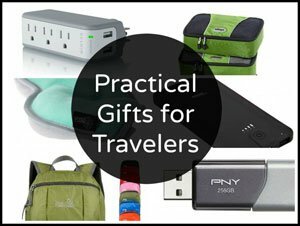 Like most destinations that cater to foreign visitors, there are a few tacky souvenir shops and touristic restaurants mixed among the wine shops, art galleries, and hidden gem cafes. When in a new place, we always look for an opportunity to get up high above the rooftops. 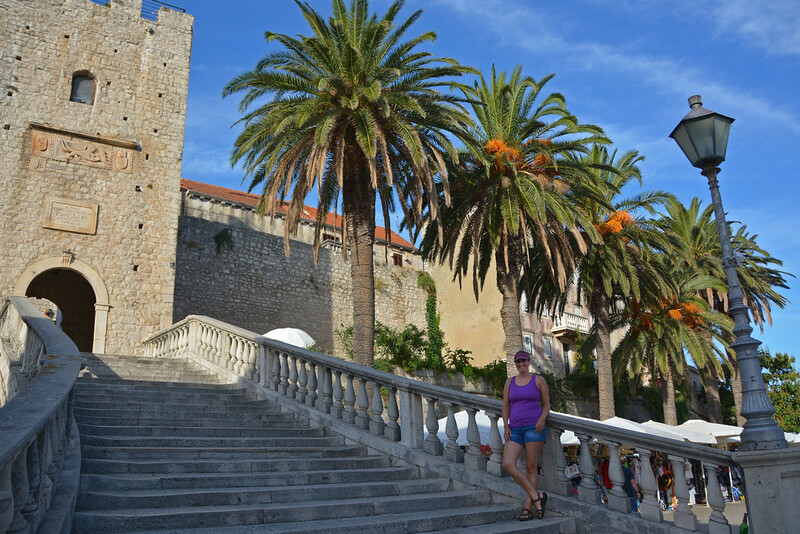 Korcula was no exception, as we paid a nominal fee and nervously climbed the narrow, winding staircase to the bell tower of the 15th-century Gothic-Renaissance-style St. Mark’s Cathedral. 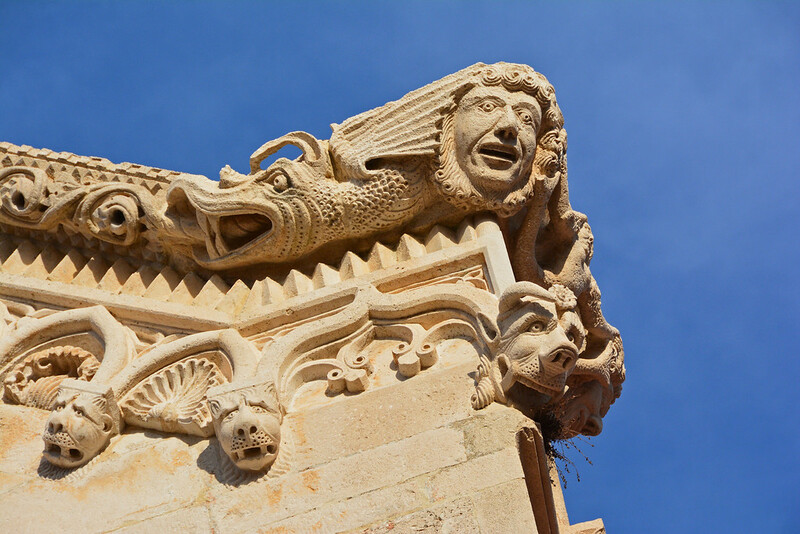 The gargoyles on the triangular gable cornice were most interesting. 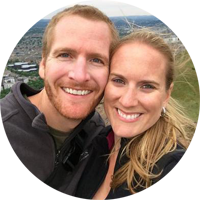 Though the climb to the top was a little harrowing (not recommended for the claustrophobic or acrophobic), the views were certainly worth the effort. 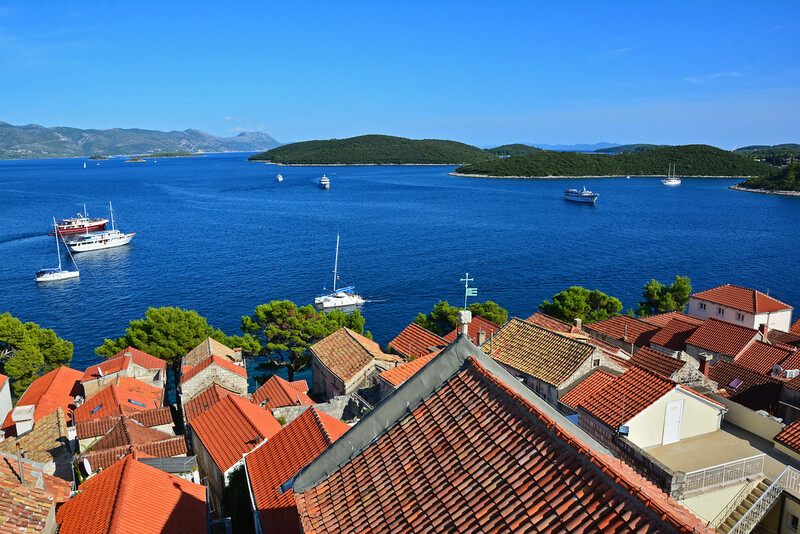 Looking over the terracotta rooftops, we could see Old Town in its entirety and the surrounding harbors below. 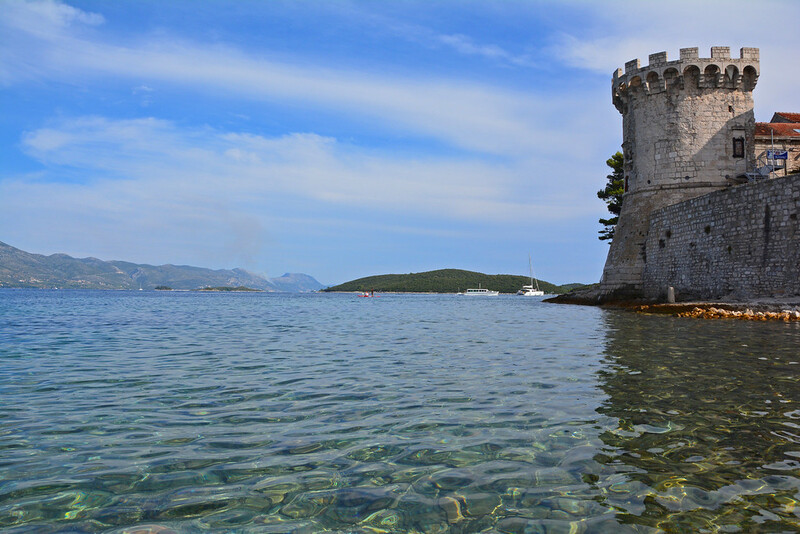 The tower also provided outstanding views of the Croatian mainland (left) and the nearby archipelago (center and right), which we later explored by kayak. 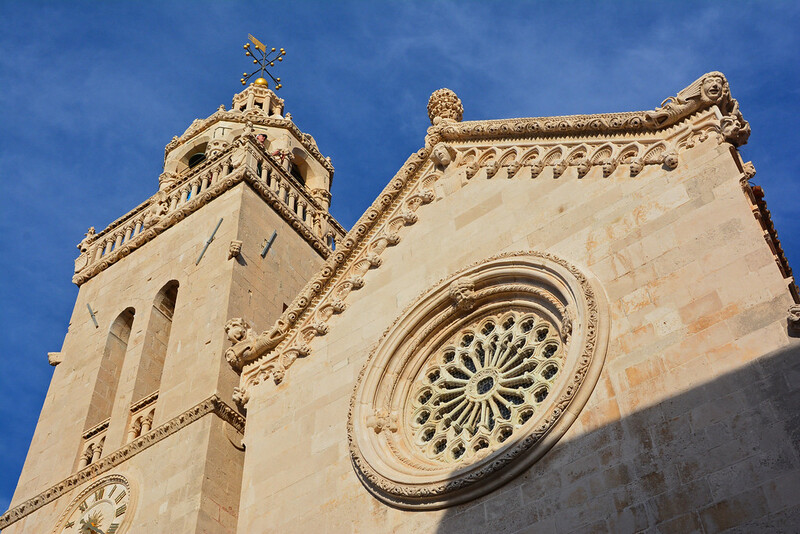 Wanting to capture an image above the entire Old Town, including St Mark’s Cathedral, we set off in search of adventure! Too fearful to rent scooters, due to our lack of experience, we decided to walk. We took a set of stairs leading away from the Old Town and turned left. We passed the large Tommy Supermarket (on the left), turned right in the roundabout, and took another right onto a dirt road (past a driver’s education lot). Not knowing where we were going and with no destination in mind, we wandered until we came upon an old-looking fort. We expected the fort to be abandoned, but low and behold there was a very chatty gentleman manning the tower. His role was to keep an eye out for fires in the area, and boy, did he have some stories to tell. He obviously doesn’t get many visitors in this off-the-beaten-track location! The views from the top of the tower are outstanding, though we couldn’t see the Old Town from there. Scorching heat from the sun was repressed by the gentle sea breeze as we stood atop the tower taking in the breathtaking scenery. 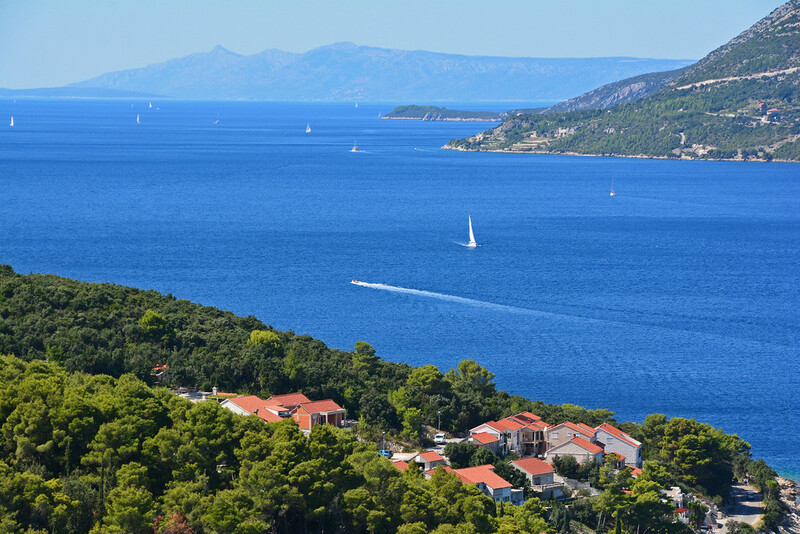 To one side was the nearby archipelago and to the other, the Croatian mainland with the island of Hvar in the background. 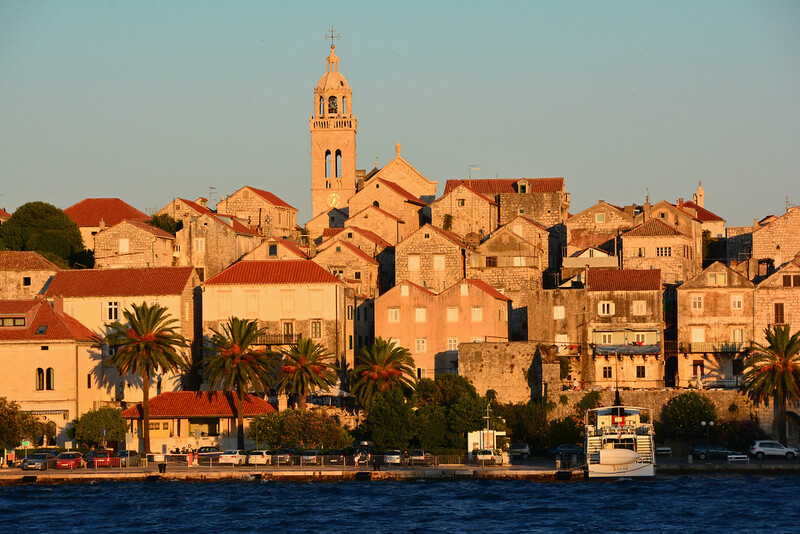 We also visited Hvar during our custom-made island-hopping itinerary. 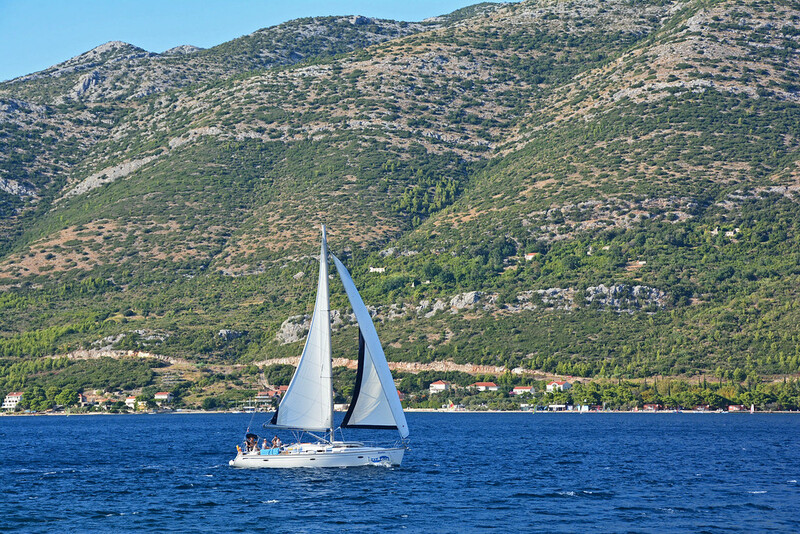 Sailing in Croatia… doesn’t get much better! Even though the views were great at the fort, it still wasn’t quite the image I was hoping for, so we made our way back down the dirt road we came in on and at the fork, took a left on a more ‘established’ looking road. After about a 10-minute walk, we found the picture-perfect view over the Old Town that initially prompted our quest. 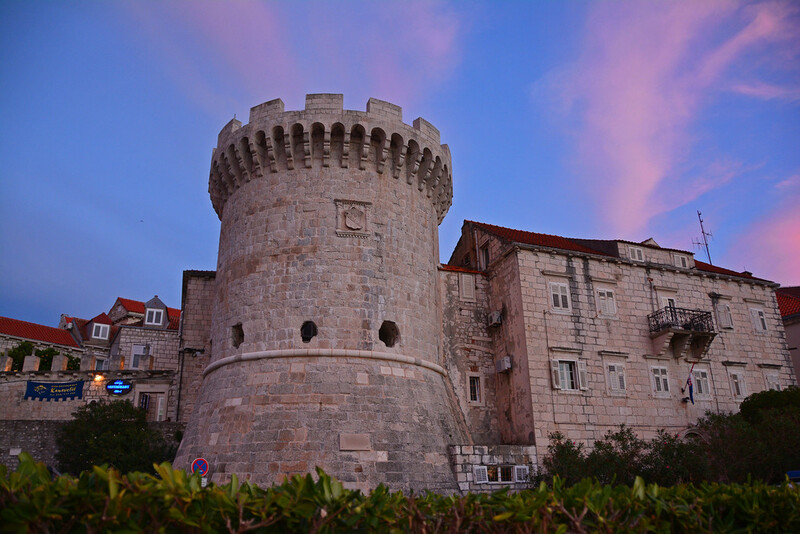 Another great view of the walled city can be seen by simply walking along the water’s edge toward the west. It’s also a great place to capture the sunset illuminating the Old Town with the sun setting behind you. 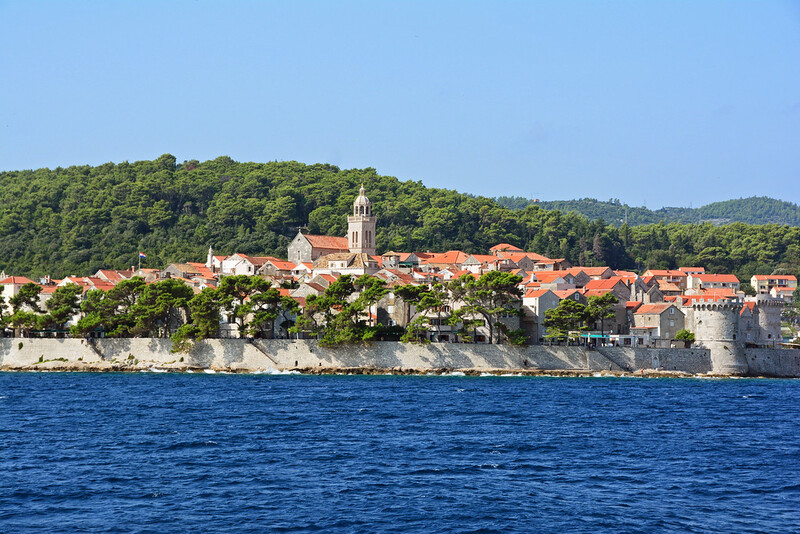 One of our favorite swimming spots was just to the left of the walled city (from where the ferries dock). The water was crystal clear with only a tinge of coolness on the warm September days during our visit. There’s only a sliver of rocky beach, enough for just a few people to sit and relax. We, however, spent most of our time in the water! You almost didn’t need a mask, the water was so clear! Fortunately the apartment we rented was just a 2-minute walk to the harbor, so watching the sunset was an every night occurrence. The winds were so strange on the island. Some days/nights, the water was smooth as glass and other times, it was like a hurricane was coming in. During one particular night, just after the sun dipped below the horizon, the sky started to transform into a pastel blue canvas with cotton candy streaks. 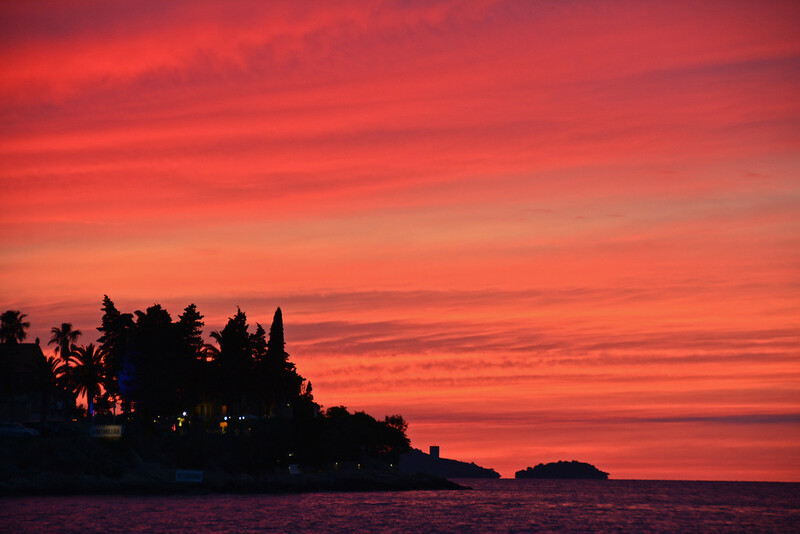 The most AMAZING sunset we have ever witnessed! 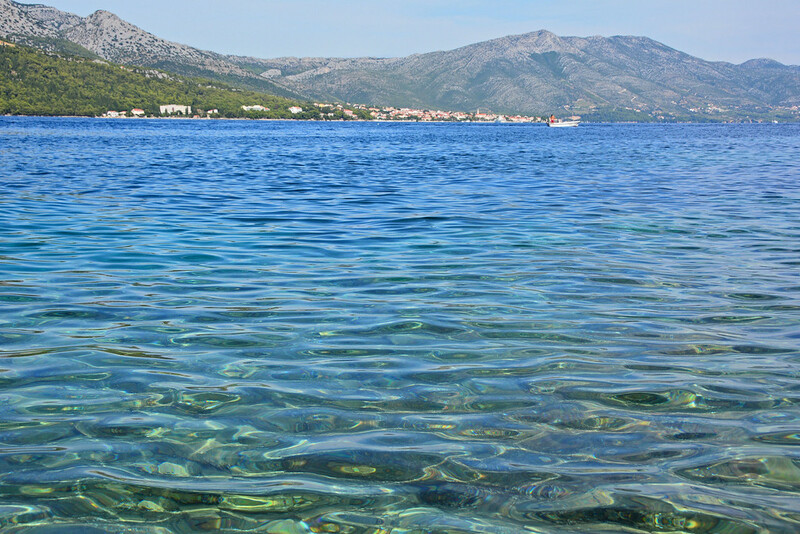 One of our other favorite swimming spots was about a 3 minute walk from the Korcula bus station (heading away from Old Town). I’m not sure if this particular beach has name, but it was a great place to swim (pretty much no waves) and it was located right near the Oreb Club Sailing School. 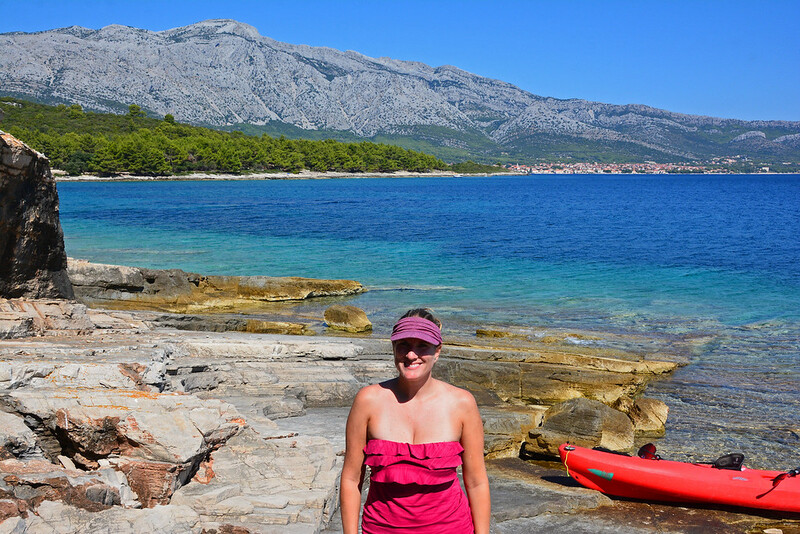 While we didn’t learn to sail during our time in Korcula, we did rent a kayak for a few hours from them. 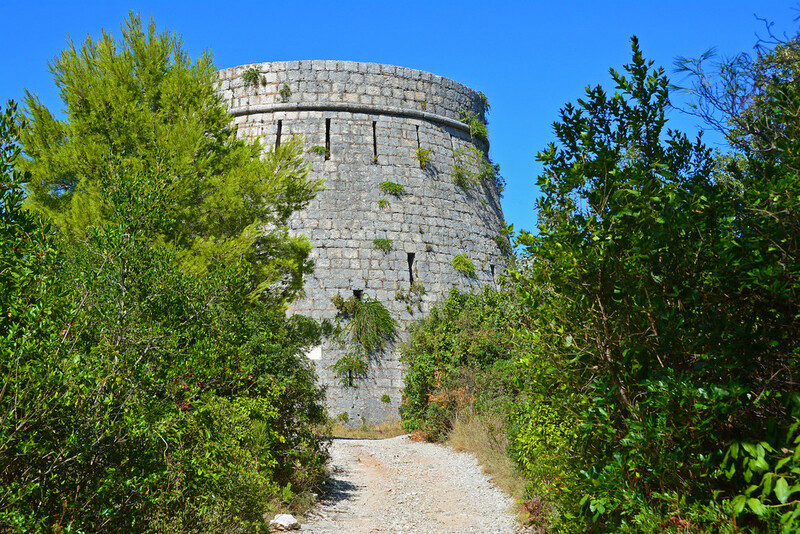 We couldn’t wait to explore the nearby archipelago that we had seen from both the St. Mark’s bell tower and the fort. The hourly rates, in our opinion, were extremely affordable, so we took the kayaks out for a paddle around the islands! 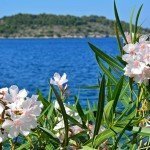 We stopped off Planjak Island to enjoy the picnic lunch we had packed and enjoyed the view of Badija Island with the Croatian mainland in the background. 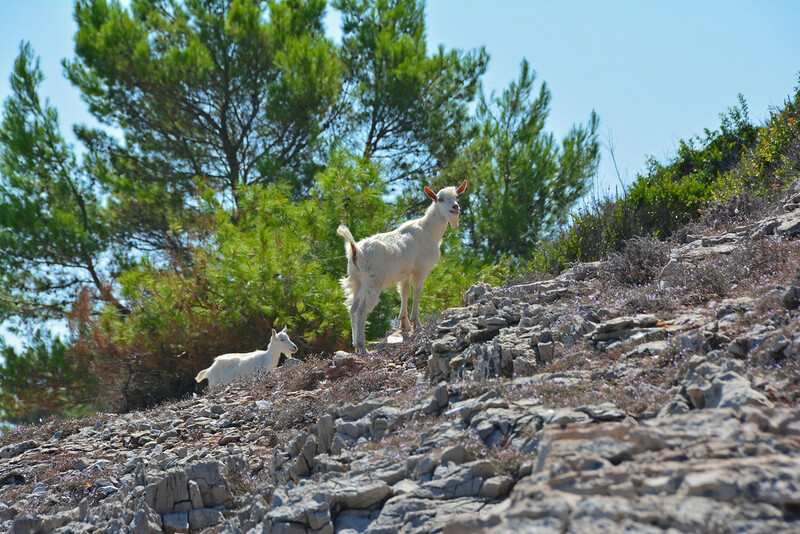 The cool thing about Planjak Island are the resident goats! And remember that crazy wind we talked about earlier?! So, that decided to pick up just in time for our paddle back to Korcula. We were headed straight into the wind and caught some air on a few white-capped swells. Honestly, it was pretty fun, but we’re fairly experienced kayakers. Oh, so THAT’s why we had to sign a waiver including the price of a ‘rescue’ if required. The employees at the kayak rental company are pretty good at knowing when the winds will pick up. They did warn us that it might be a little tough coming back, so if you’re at all nervous about ‘getting stuck’ out there, just ask and they’ll advise you with a better time to go. 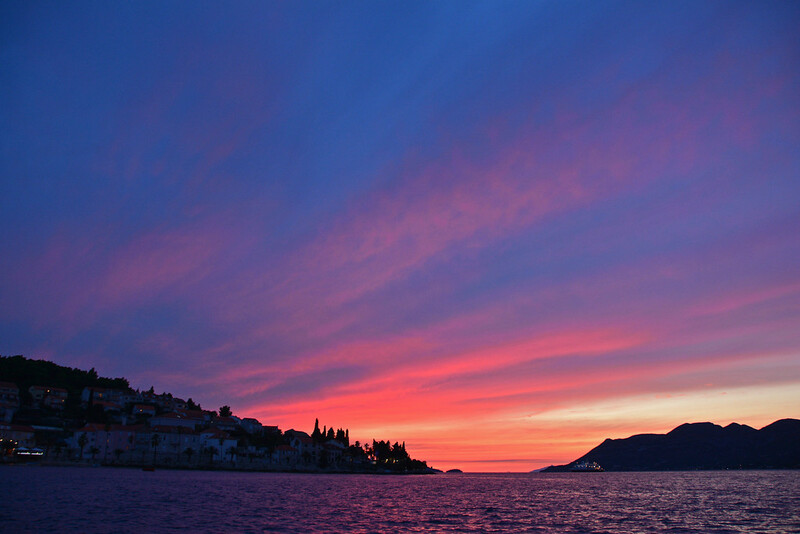 Overall, we absolutely adored Korcula. There was plenty to explore right in the heart of Old Town. 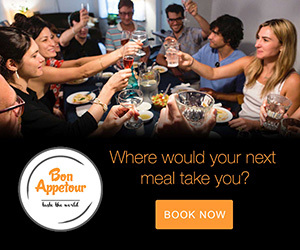 Everything we needed/wanted was within walking distance. Maybe when we go back, we’ll venture and out explore more of the island, but we were completely satisfied for our first visit. Though, we didn’t make it to the little wine village of Čara, we did buy some Pošip (white) wine from that village in the local super market and it was one of the best European white wines we’ve had. 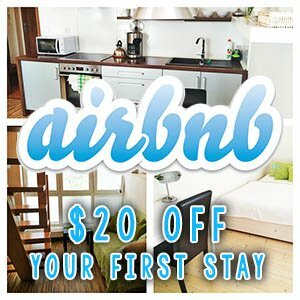 Highly recommended you give it a try! 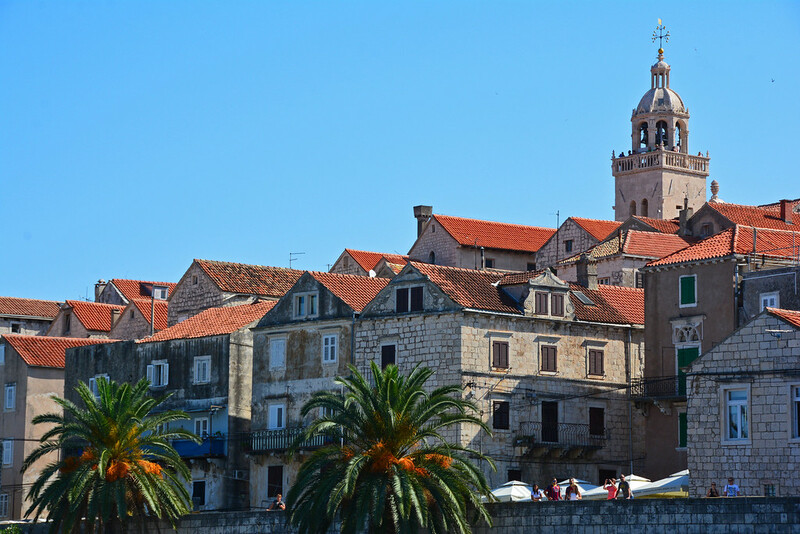 From Korcula, we took a ferry back to the mainland where we visited the congested, yet mystical town of Dubrovnik. We struggled with falling in love with this city, but were still glad we made it a part of our do-it-yourself island hopping itinerary.